I first got to know John Collings in the late 1960s when I got a job at The Bridge Academy, a bridge school in North London owned by John Collings and Jack Nunes. Working there with John, I soon became captivated by the charm and charisma of this larger than life character whose natural flair and talent for bridge was matched only by his vivacity and open handed generosity. Cansino's jump to 7 was an attempt to prevent the vulnerable NS from discovering whether they could make 7NT (In those days, the penalties for NVul understricks was not as severe as today). John said to me later "All the bridge press reported how, after a crazy psychic bid, I ended up in 7 doubled going 10 down. What no-one reported was that anyone else in the bridge world would have gone 11 down!" But, as was reported in the Bridge Magazine by Ewart Kempson, many a player would have carelessly or in the depths of misery played low from dummy when North switched to a cunning 9 at trick 4 but John was never in the depths of misery when there were cards in his hand. Prophetic remarks which remained true from that day until the last major international in which John took part which was just 6 months in the World Olympiad in Istanbul when I had the honour and pleasure of again being his NPC. In 1965 John and Jonathan were also runaway winners of the Life Masters pairs (The Waddington Cup), and also won the Gold Cup. He won Crockford's cup in 1964 and 1966 which was also the year of his famous victory in the Spring Foursomes, overturning a 48 IMP deficit in the last 8 boards of the final. But within a few years tragedy was to strike both these talented youngsters. Jonathan suffered a brain tumour and John had two heart attacks. John was prescribed medication for his heart condition which had an unfortunate side effect affecting his eyes - a problem which remained with him for the rest of his life. John returned to international success, playing in the European Championships with Paul Hackett in 1981. Then, he played an innovative system called "The Walpurgis Club" which included some strong pass sequences in 1st or 2nd position. This system had many triumphs and led to a silver medal for Great Britain, and 5th place in the Bermuda Bowl in New York in the same year. He was married in the 1960s to Pamela but after his first divorce married Noura from the Lebanon. For much of this time, John lived in the house of his parents in South London . John formed close friendships with many of the top Swiss players such as Tony Trad and Jean Besse (he won the Sunday Times in 1969 with Jean Besse), and lived for many years in Switzerland during which time he was relatively unknown in Britain . After his return in the 1990s; now again divorced, he resumed his playing career in England , forming a partnership with a promising England junior, Martin Jones. This led to a consistently high performance in national events (winning the Gold Cup in 1997 and 1999) and in British and English trials. He played in the European Championships in Malta in 1999 where the team narrowly missed qualification for the Bermuda Bowl. In the English trials 2 years later, John bowed out at the final stage although in a leading position to travel to Indonesia to marry and return with his new wife, Lusy. As recently as 2004, John was still at the forefront of English bridge, representing England in the Seniors series in the European Championships in Sweden and the World Bridge Olympiad in Istanbul . I was honoured to be John's NPC in Istanbul and also 5 years earlier in Malta . 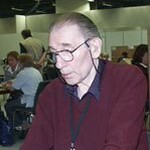 I was able to witness at first hand how this great old man of bridge, although suffering from ill health, displayed at the bridge table some of the old magic which had made him into one of the most successful, talented and highly respected and loved players in history. He is survived by his lovely and devoted wife, Lusy who - together with all of the bridge world - will miss him sorely. Collings first represented England at bridge in 1961 partnering Ronald Crown, but Crown went to the USA and Collings formed a partnership with one of Britain's most talented players, Jonathan Cansino. In 1965 they represented England in the Home Internationals, won the Gold Cup, the premier event in Britain , and represented Britain in the Europeans. Collings had three more Gold Cup wins, the latest being in 1999. He was a master of the bluff bid and opponents who tried to second-guess him rarely came out best. At the 1966 World Pairs Olympiad Collings and Cansino were sixth and soon after Collings moved to Geneva whre he formed bridge partnerships with the leading Swiss players of the day, Jean Besse and Tony Trad, and represented Switzerland on two occasions. Following his recovery from a major heart attack Collings moved back to London where he ran a Bridge Academy owned by Jack Nunes. The British team, with Collings partnering Paul Hackett, won the silver medal at the 1981 Europeans. His most successful partnership in recent years was with Martin Jones of Warwickshire, a player 40 years his junior. They represented Britain in the 1999 Europeans, the last before Britain became England, Scotland and Wales for European and World events. They represented England as recently as 2003 in the Home Internationals, and last year Collings partnered Martin's father, David, in the England Senior Team at the World Olympiad in Istanbul. Friends and opponents alike reminded Collings of his remark made some years earlier, "If you see me in the Seniors, I'll be dead, and even then I'll be above average."